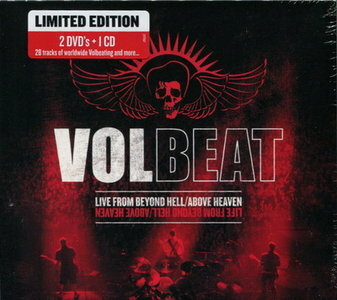 Volbeat is a Danish heavy-metal band formed in Copenhagen. They play a fusion of rock and roll, heavy metal, punk and rockabilly. They are inspired by classic rock and roll artists such as Elvis Presley and Johnny Cash, as well as more contemporary hard rock, punk rock and metal bands, such as AC/DC, Social Distortion, The Misfits, Napalm Death and Metallica. They released "Live From Beyond Hell/Above Heaven" on November 25th on Ltd. 2DVD + 1CD, 2DVD, Blu-Ray, CD and 3LP! The DVD/Blu-Ray contains a total of 28 live tracks from Denmark, Germany and USA and a short documentary "Beyond The Scenes". Прошу обратить внимание на то, что весь материал, представленный выше, предназначен исключительно для ознакомления! Приобретайте, пожалуйста, легальные диски, которые вне всякого сомнения станут достойным украшением вашей коллекции!